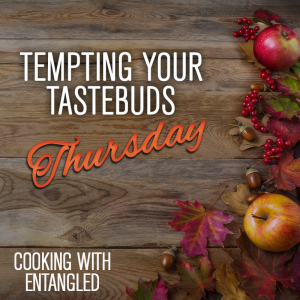 When Annie Seaton is not writing or reading, she loves to cook, so it’s not surprising that in her current Prickle Farm series there is lots of scrumptious country cooking. Gran’s chocolate cake is everyone’s favourite and wins prizes at the show in Her Outback Cowboy. Homemade pizzas feature in Her Outback Surprise so watch out for a pizza recipe next time Annie comes to visit! 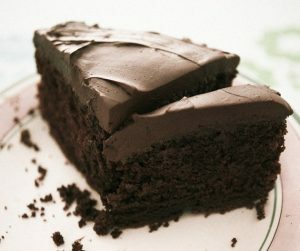 A chocolate cake just like Gran makes . . .
From the CWA Cakes Cookbook. Once the cake is on the oven, what’s Annie up to? She’s writing the next book in the Prickle Farm series, His Outback Nanny! 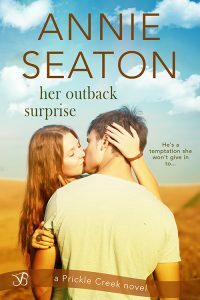 Have you read Her Outback Surprise? You can get it right now for just 99¢! But hurry, this deal ends soon! When Liam returns to help run the family farm, his enjoyment of the slow life in Spring Downs surprises him. After all, he’s used to the thrill of chasing the next big story. Running into the girl he’s never been able to forget is unexpected, and he’s shocked to learn she’s getting married—to someone who’s not him. She’s off-limits, but Liam can’t stop thinking about the gorgeous vet and what could have been. But convincing her he’s changed will be harder than finding a needle in a haystack. Each book in the Prickle Creek series is a standalone story that can be enjoyed out of order. Annie Seaton lives on the edge of the South Pacific Ocean on the east coast of Australia with her own hero of many years. Their two children are now grown up and married, and three beautiful grandchildren have arrived. Now they share their home with Toby, the naughtiest dog in the universe, and two white cats. When she is not writing Annie can be found in her garden or walking on the beach… or most likely on her deck overlooking the ocean, camera in hand as the sun sets. Each winter, Annie and her husband leave the beach to roam the remote areas of Australia for story ideas and research. 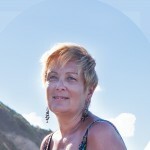 Readers can contact Annie through her website annieseaton.net or find her on Facebook, Twitter and Instagram.